Home » वडा भवन निर्माणको लागि विधुतीय बोलपत्र आव्हान (E-bidding) !! वडा भवन निर्माणको लागि विधुतीय बोलपत्र आव्हान (E-bidding) !! 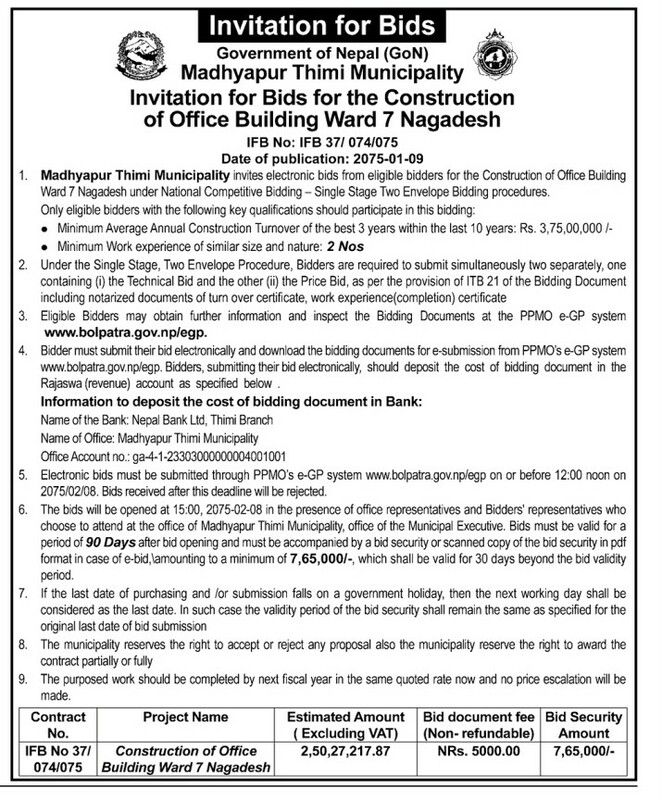 Madhyapur Thimi Municipality invites electronic bids from eligible bidders for the Construction of Office Building Ward 7 Nagadesh under National Competitive Bidding – Single Stage Two Envelope Bidding procedures. Eligible Bidders may obtain further information and inspect the Bidding Documents at the PPMO e-GP system www.bolpatra.gov.np/egp. Bidder must submit their bid electronically and download the bidding documents for e-submission from PPMO’s e-GP system www.bolpatra.gov.np/egp. Bidders, submitting their bid electronically, should deposit the cost of bidding document in the Rajaswa (revenue) account as specified below . Electronic bids must be submitted through PPMO’s e-GP system www.bolpatra.gov.np/egp on or before 12:00 noon on 2075/02/08. Bids received after this deadline will be rejected. The bids will be opened at 15:00, 2075-02-08 in the presence of office representatives and Bidders' representatives who choose to attend at the office of Madhyapur Thimi Municipality, office of the Municipal Executive. Bids must be valid for a period of 90 Days after bid opening and must be accompanied by a bid security or scanned copy of the bid security in pdf format in case of e-bid,\amounting to a minimum of 7,65,000/-, which shall be valid for 30 days beyond the bid validity period. If the last date of purchasing and /or submission falls on a government holiday, then the next working day shall be considered as the last date. In such case the validity period of the bid security shall remain the same as specified for the original last date of bid submission. The municipality reserves the right to accept or reject any proposal also the municipality reserve the right to award the contract partially or fully. The purposed work should be completed by next fiscal year in the same quoted rate now and no price escalation will be made.